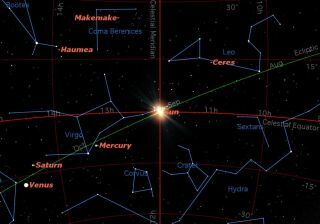 The sun crosses the celestial equator on September 22 at 4:44 p.m. EDT. On this date the sun rises due east and sets due west, and the day and night are of equal length. Twice a year, the sun crosses the celestial equator, moving from the Northern Hemisphere to the Southern Hemisphere, or vice versa. These two crossings are very important for the inhabitants of Earth, because they mark the change in the direction the sun's rays fall on Earth. After Sunday, the sun will shine more on the southern half of our planet and less on the northern half. Summer will be over in the Northern Hemisphere, and fall will have arrived. Winter will be over in the south, and spring will begin. The sun will continue on its path southward for the next three months, reaching its southernmost point on Dec. 21, the date of the "solstice." In the Northern Hemisphere, the days will become shorter, the nights longer, and the temperatures colder during this three-month trek, all as a result of the sun's being south of the celestial equator. It's always important to remember that this is part of a cycle, and that after Dec. 21 the sun will start moving northward again, and spring will be on its way. Follow us @Spacedotcom, Facebook or Google+. Article on SPACE.com.